A sawhorse is the sort of woodworking appliance you do not think about a lot until you need one. Needless to say, having one in your garage is a must. Whether you’re a professional carpenter or a hobbyist. In the 1500s, sawhorses started out as mere wood stands. Carpenters used them to support materials while one worked. However, just like all other woodworking appliances, they have evolved since then. Nowadays, they come with different features and materials. Which gives you a wide array of options to choose from. This brings me to the sad news. With so many sawhorses to choose from in the market, finding the best one will be, without a doubt, a pain. There are lots of factors to consider, and narrowing them all down can be confusing. But before reviewing the list of the best saw horses, let us start by understanding what a sawhorse is. 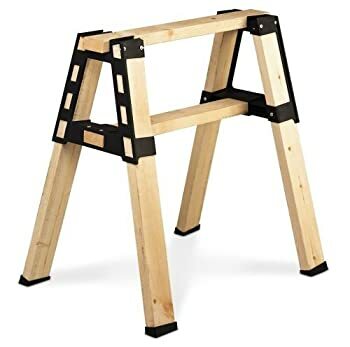 Basically, a sawhorse is a four-legged woodworking appliance that grants you space to place your board or lumber while sawing. Just imagine it as a desk without the top. Your lumber of board will act as the top. This makes it easy for you to cut it into your desired pieces and sizes. The best sawhorse is also advantageous in other great ways, such as their adjustable design. You can quickly adjust them to match your own comfort and height. Sawhorses have been around for hundreds of years now. And they have been used by virtually everyone, from house builders to shipwrights. I can personally attest that there is no easier way to support lumber and other material than using a sawhorse. As I mentioned in the preceding section, sawhorses have evolved over the years. Conventional wood sawhorses had to be stacked together when not in use. These days, however, folding models have been invented. They save space and are easy to carry around when one is on the field. And even though most types boast a fixed height, adjustable models are the most common. Better yet, state of the art models can even be extended for width. With that out of the way, let me teach you how to use a sawhorse. This section will educate you on how to use your sawhorse effectively. First, unfold your sawhorse and position your lumber on the top. Make sure you position the saw horse in a way that the wood you’re working on hangs off a little bit on both sides. You want the end of the lumber you cut to drop off on one side. What you do not want to do is cut the material at the middle of the sawhorses. Doing so will cause the wood to break off before you’re done cutting because of the weight at the center. As you’ve already figured, this could destroy your timber, or worse, injure you. Also ensure you clamp your work piece to the sawhorse to help secure it. Another way to secure your material is to screw it to your sawhorse. But note this is only possible with wood sawhorses. Cut your logs into the sizes you desire. And once you’re done, fold the sawhorses place them back in the storage. As discussed, the sawhorse is a simple, but essential tool for everyone in the carpentry and construction industry. As such, most sawhorses boast the same basic type, construction, and carry out similar functions. They are usually built with two sets of legs that are joined together by a beam at the top. They also boast brace beams which award it that renowned A-shape. The most common in the carpentry industry is the wooden sawhorse. In fact, some individuals prefer to create their own wooden sawhorses. But a majority prefers to buy them when they’re already made. Acquiring one allows you to get features you cannot construct yourself. Sometimes, you may cut into your wood-made sawhorse while working. If that happens, it will not cause any serious damage to your saw blade. And you can also repair it easily. The 2nd and most famous kind of sawhorse is metal. These types are usually constructed with hinges for portability and easy folding. They can also be used to cut other kinds of metal. You can find them in industrial settings. Metal sawhorses are less common for residential projects because the metals can damage your wood. They need experienced woodworkers to operate. Most metal sawhorses are also created using steel. And if you take good care of the equipment, it will last for lots of years. Also keep it out of elements, such as water. The third, but least known type of sawhorses is the chainsaw horse. This is a heavy duty sawhorse and is quite hard to build by yourself at home. The chainsaw horse is used to cut large pieces of logs or lumber. You will likely find it in the timber industry. Some chainsaw horses are made out of wood. However, most of them are made of metal in order to boost their durability. Last, but by no means, the least, is the lightweight sawhorses. Most firms sell lightweight sawhorses built specifically to improve portability. These sawhorses even retail with storage compartments where you can hold the tools. Many also fold to improve transportation convenience. How do you choose the best sawhorse? That is a great question you should ask yourself if you want to choose a tool that meets your needs and requirements. You see, there are lots of sawhorses to choose from out there in the market. Worst yet, each of them claims that it is the best. But are they? My answer to that is both yes and no. Wondering how both answers apply? Well, it comes down to your preference and needs. Let us say you need to work with bigger woods. Then, without a doubt, you’ll need a heavy duty sawhorse with a tough build. On the other hand, you can execute light works using lightweight (but sturdy) saw horses. With that brief tip in your mind, here are several features you should look for when acquiring a sawhorse. Individuals are not just different by nature. We are also different by height. Some of us are tall, others are short, and the rest are someplace in between. So you need to check the height of the sawhorse you’re about to choose well. If it is too tall, you will be unable to reach it easily. And if it is too short, you’ll need to bend over to work on your projects. This will undoubtedly cause back pain in the future. When you’re working, the sawhorse will undergo lots of stress. So ensure you take a close look at its build material before you acquire it. The one you choose should be built with aluminum or steel. If it is not, rest assured it won’t be able to endure the stress. Most people nowadays prefer to work in open areas rather than closed spaces. For this reason, the demand for portable saw horses is on the increase. Also, check the weight. The biggest sawhorses boast heavyweight capacities. Smaller sawhorses, on the other hand, have the opposite. Is acquiring the heavier ones always a great choice? Not really. The biggest ones are quite expensive, and if you’re just a hobbyist, acquiring an expensive one is a bad decision. But if you’re a professional, buying the heavy one is obviously a better decision. 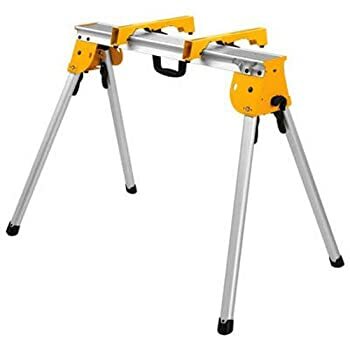 This is undoubtedly the feature that makes a sawhorse the best one in the market. The easy assembling feature will save you lots of work time during every project. This will obviously increase overall productivity. Now that you know how to choose the best sawhorse, let us skip to the main section of the post. Instead of a simple sawhorse, DeWalt refers to this appliance as a heavy-duty work stand. There is no doubt that its construction is solid. Even better, the metal frame is astoundingly sturdy. Each horse is able to support up to 1000 lbs. at a time. In addition, even though the construction of this appliance is metal, it is made of aluminum rather than steel. This awards you portability at the expense of some long term durability. Sturdy as it’s made, this woodworking appliance is way lighter compared to equivalent models made of steel. As a plus, the aluminum is resistant to rust. DeWalt DWX7225B’s legs fold away to improve storage and ease of transportation. When needed, its legs will quickly fold out and get locked in place using a special lever. This ensures the horse will not collapse amidst usage. DeWalt is already a respected brand in the realm of tools. So it is no surprise that this sawhorse meets all high-quality standards set by other tools from DeWalt. 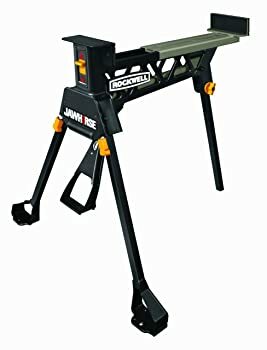 Rockwell JawHorse RK9003 is another excellent choice. It retails with what is possibly the best clamp on sawhorses on the market. The clamp can provide you with up to a metric ton of force. This is about 2205 pounds. That is an absurd amount of clamping force. It is even enough to easily lock just about everything you can lift up to the surface. It is also sturdily built and will hold lumber of up to 600 pounds. The bottom line is, if you can lift it up onto the appliance, Rockwell JawHorse will hold the weight and keep it securely in place. It also retails with a state of the art foot control for the clamping system. This implies that you can hold the piece you are locking in place using your two hands as you set the clamps using a foot. This function is very useful. Particularly if you are going to be working with something bulky or heavy and would need to hold it with both hands while setting up. The Louisville 3-Foot sawhorse ladder boasts a 300lb load capacity. Designed with an opening at the center of the top side, this sawhorse is easy to handle. It is also lightweight, which makes it easy to move around your workplace. This ladder combines two important tools to create a support tool you can use to saw and other woodworking tasks. Do you need a scaffold that allows you to move from one side to the other? Simply place down a metal plank or scaffold grade wood between the two to walk across. 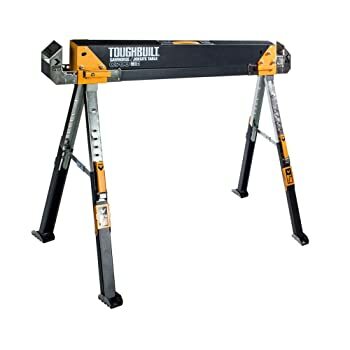 This folding model from ToughBuilt is one of the most renowned sawhorses out there. When you try it out, it is not hard to see why. The appliance’s solid construction makes it quite capable of handling 2200lbs on a set of two. The zinc plated steel prevents corrosion. 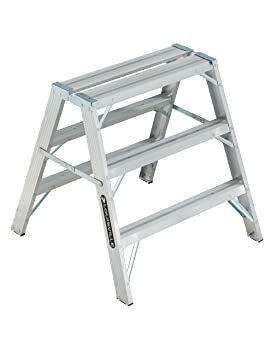 The pivoting feet, on the other hand, help you to set up the sawhorse such that it’s perfectly level. Even if the surface you have placed it on is not level, the appliance will be perfectly level. If you are looking for a basic sawhorse as a hobbyist, this is the best way to go. Not only will you get something affordable, but you will also get something that is durable. That said, you’ll need to get your own 2x4s in order to put it together. On the other hand, you will get all the supports and braces you may need to keep your new sawhorse in good shape. This DIY appliance is also super simple to complete. Furthermore, you can make it up to 4 feet high and 8 feet long. With everything set together, it will be able to support up to 2000 lbs. between the 2 saw horses. I hope that this buyer’s guide and product review has been helpful. I hope you can now understand what separates the best sawhorses from the rest of the “mediocre” herd. Armed with all this information, you can now be able to pick the model that best meets your preference and needs. The options I have mentioned should also prepare you for any upcoming projects.